Our site here has given you dozens if not hundreds of new spells to add to your witchcraft repertoire, but are you ready to start writing some of your own spells now? You're going to need a good guide to the correspondences then. And here it is. The Spell Crafter's Compendium is a complete guidebook to the magickal correspondences that go into spell writing. This handy ebook has the attributes of all major herbs, crystals, colors, planets, Deities, animals and more. I've also listed everything by intention, so you can look up the necessary items for spells on love, money, health, psychic talents, creativity, strength, sleep and many other popular purposes. This ebook is available as a PDF from our ebook shop, or you can get the Kindle version from Amazon. Either way, it's a handy and portable guide to take with you. Make sure you know what that clover blossom or sodalite crystal is good for before you make a purchase. 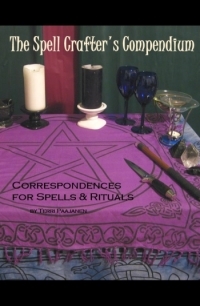 There are more than 100 pages of information, with several hundred important magickal correspondences. Everything you should need when you're building a new spell.